Time to put down the glass of champagne and handful of party mix, and get back to it. The back to back 4 day weekends I took off from work were so refreshing, instead of feeling worn out for a change, I was up for some poking around in the yard, looking for the beautiful gems, despite several piles of mush, which I am currently choosing to ignore. I’ll have some more work to do to get to that stage where my winter garden holds up. 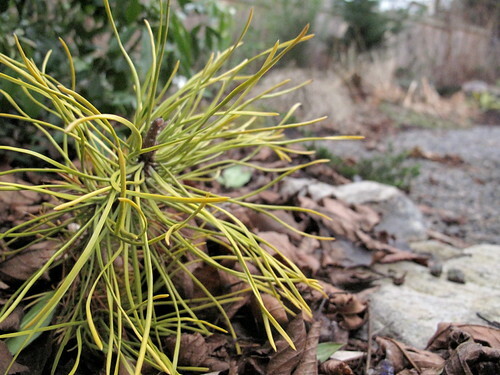 I’ve been putting a lot of attention into acquiring more evergreen plants, but I’m learning that while some plants may be “evergreen,” that doesn’t necessarily mean they look terrific during the cold months. I’m calling out the plants that are living up to the promise, that don’t look like they’re having a bad hair day. Cheers to the plants that keep the garden spirit alive in the middle of winter! How adorable is this dwarf golden sweet flag? So bright and cheerful peeking out of the edge of pathways. Just three plants currently dot the edge of the garden right now, but it’s been a trooper with no extra attention from me, so the next time I see it at a sale, I’m buying it by the armload. My first winter with a Reeves Skimmia finds it chugging along just fine in full shade with zero care. The blooms don’t come till spring according to the tag, but the buds have been forming for quite a while, which does wonders for keeping the garden feeling like it’s on the verge of bursting into spring. Another beam of gold standing out, my somewhat Seussian Chief Joseph Pine, with extra long needles, I believe on account of the lack of sun I can provide. No matter, the needle color is still spectacular. I have a soft spot for Campanula takesimana, for its carpet of glossy leaves nearly year round. While not technically evergreen, it is always doing this, putting out new growth when very little else is following suit. The pink blush on new leaf tips is a nice touch. 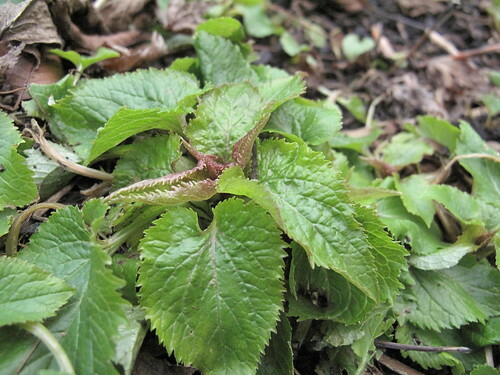 If it follows the pattern from previous years, it should be fully leafed out and covering its patch of soil within the next month, which makes up for its late flowering ratty appearance in summer. There are plenty of times I look down at Anthriscus sylvestris ravenswing, and think I just have to rip it out. It goes through a serious ugly duckling stage after blooming. Something always stops me though, and part of it is the early new growth, which just looks like carrots for now, but the leaves turn black earlier than many other black leafed plants start showing off, and so it stays. This time of year, you can see how many seedlings it has promiscuously spread around the garden. So far, it’s not scaring me off with its prolific reproduction, but one of these years, its numbers could become problematic and might need to have its enthusiasm surpressed. 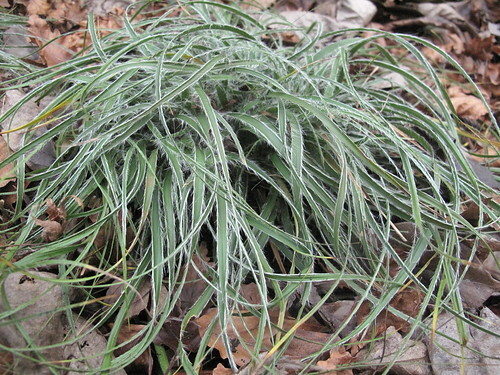 Luzula nivea, the dry shade evergreen plant that seems too good to be true. After 13 degree nights followed by a surprise blanket of snow a few days ago, and have you ever seen such a happy looking plant in winter? I can gladly report that it looks just as good – in a cousin itt way – in winter as it does in summer. 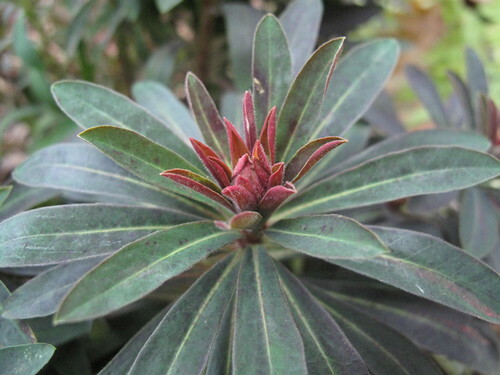 Oh, the trusty euphorbias. Sometimes I worry I’m overdoing it, but such reliable performances deserve to be rewarded. And on a warmer, indoor front… Boy have I been reluctant to mention anything about the arrival of the puppies. I don’t consider myself superstitious but I worry about jinxing it. December 30th, the day after the snow, Cupcake had her puppies. While a typical litter would have been five to seven dogs, we have only two, which is a perfectly manageable number for a skinny dog mom and an anxious foster dog mom to watch after. Despite all my handwringing worries, Cupcake is an attentive mom, and the babies are on track to double their size in the first 8 days of their life, so things must be going right (knock on wood). I’m looking forward to them getting a little more robust so I can stop waking up the babies to make sure they’re breathing (a nod to you if you remember such a scene from Terms of Endearment). A belated happy new year to you all, here’s to wonderful things to come. Sweet puppies Megan. You are an attentive mom too! Good for you. Wonderful to see all those plants through the winter cold. 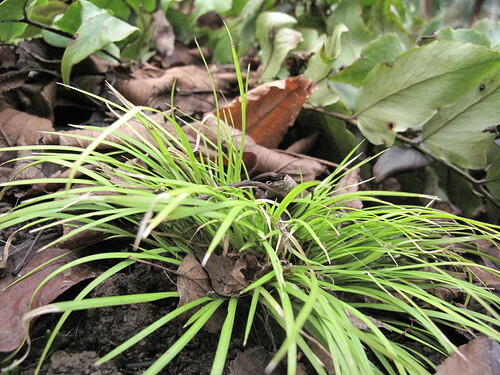 Good to hear that the dwarf sweet flag does so well. Thinking of having some in my new garden. ps-but I like the party mix! From the stairway window this morning I saw a dark area in the grass which appeared to be freshly composted gardening space. After a perplexing moment of excitement, I realized it was shadow from the retired Christmas tree. But it sure gave me ideas about new planting space. Plant lust season is just around the corner. Yippy. Congrats on the foster baby arrivals to you and Cupcake! They will be fine, don’t worry so much. Mom knows what to do. The sweet flag, skimmia and luzula are going on my list. My parking strip is a wasteland, even some of the kinda-hardy stuff is toast and it’s a big brown sadness out there right now. Hooray for the Chief Joseph, I never get tired of seeing that adorable tree and am so glad you decided to go for it, if it’s giving you this much enjoyment in its first year. Your plants are all so cool. I think I only recognized one of them-the skimmia. Geez. The dog is so adorable and I agree. 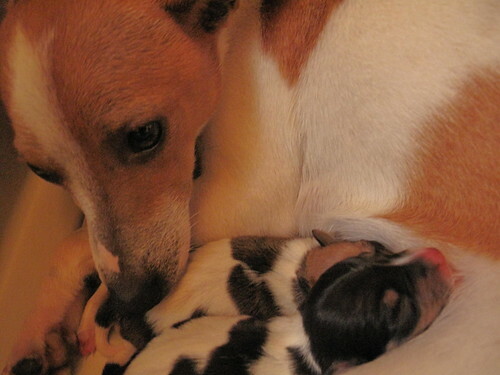 Two puppies is more than enough for a foster mom. I fostered 6 golden puppies at one time for a rescue operation and OMG, I had no idea what I got myself into but never again. Good luck with the little cuties. So glad so many things in your garden are looking good! I can’t wait to see what the blooms on the Reeves Skimmia look like. And those little puppies, just too gosh darn cute! Your Reeves Skimmia certainly does look as if it’s ready to bloom. Very pretty! I need to get out in our garden and see if anything is doing anything! Nice to see how well some things are doing in others’ gardens. I like the look of that skimmia, and I’ve already promised myself the luzula nivea (maybe several) this year for my shady bed to come: I always was an Addams Family fan. The puppies are just lovely. That sweet picture of Cupcake with her babies makes me ache to have one! Babies for the new year! How fun! 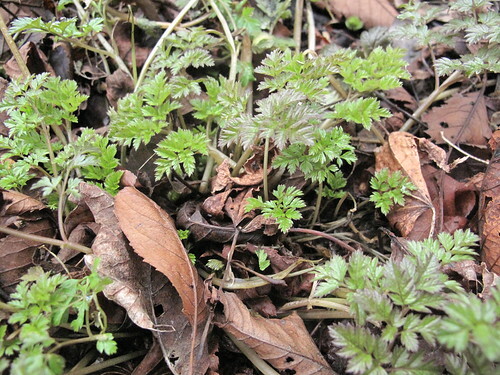 I have always wanted to add Anthriscus to my garden, but realize that my tiny garden would be over-run in no time. Its wonderful to see green in other people’s gardens. Mine remains buried beneath a blanket of snow! Janet – I know, I wish we had party mix year round! Patricia – Around the corner huh? Counting down the months, it seems like forever right now. But time flies. Karen – You’re right, nature mostly takes care of itself with or without a person worrying about it. Trying to heed the advice. Tina – Ah yes, I’ve had a big batch of puppies before, that’s a horse of a different color, for sure. Loree – I’m excited to skip past the flowers on the skimmia, and go straight to the bright red berries. Waiting anxiously. 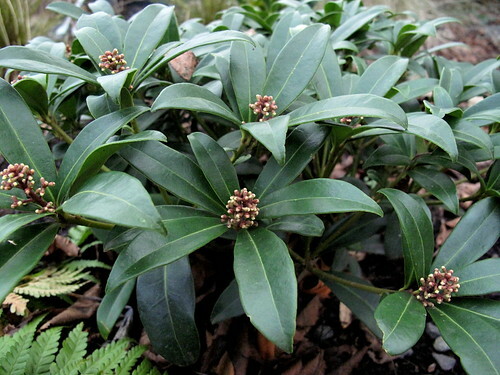 Victoria – Yes, the skimmia seems close. Can’t wait to see what you find in the garden, I love the subtle charms in gardens this time of year. Jane – I’ll let you know if I find the luzula again, they have been somewhat elusive, but I know they’re out there. teza – I envy your blanket of snow, I’d love a little of that to head down our way.